Hitler established the first concentration camp soon after he came to power in 1933. The system grew to include about 100 camps divided into two types: concentration camps for slave labor in nearby factories and death camps for the systematic extermination of "undesirables" including Jews, Gypsies, homosexuals, the mentally retarded and others. after its liberation by US forces. As the allied armies raced towards final victory, advancing troops liberated the camps one-by-one, revealing the horrors of the Nazi concept of establishing a "pure" society. The first liberation came in July 1944 when Soviet troops entered Maidanek, a death camp located in Poland two miles from the city of Lublin. Alexander Werth, a correspondent for the London Sunday Times and the BBC, accompanied the Soviet troops and described the camp shortly after its capture. The BBC refused to air his report of the camp as his description was so unbelievable they considered it a Soviet propaganda ploy. It was not until the later capture of Buchenwald, Dachau and other camps on the western front that his description was accepted as true. The Maidanek camp was established by the Nazis in 1941 soon after their conquest of the then Russian occupied region of Poland. 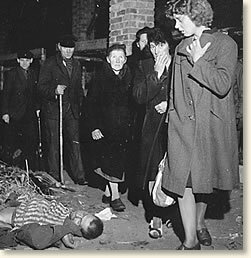 The primary purpose of the facility was the speedy extermination of new arrivals (mostly Jews) transported in from various countries including Czechoslovakia, France, Austria, and Holland. The majority of victims, however, came from the immediate area. It is estimated that 1.5 million died at the camp during its three years of operation. The inside of this barrack was made of concrete, and water taps came out of the wall, and around the room there were benches where the clothes were put down and afterwards collected. So this was the place into which they were driven. Or perhaps they were politely invited to 'Step this way, please?' Did any of them suspect, while washing themselves after a long journey, what would happen a few minutes later? Anyway, after the washing was over, they were asked to go into the next room; at this point even the most unsuspecting must have begun to wonder. For the "next room" was a series of large square concrete structures, each about one-quarter of the size the bath-house, and, unlike it, had no windows. The naked people (men one time, women another time, children the next) were driven or forced from the bath-house into these dark concrete boxes - about five yards square - and then, with 200 or 250 people packed into each box - and it was completely dark there, except for a small light in the ceiling and the spyhole in the door - the process of gassing began. First some hot air was pumped in from the ceiling and then the pretty pale-blue crystals of Cyclon were showered down on the people, and in the hot wet air they rapidly evaporated. In anything from two to ten minutes everybody was dead. . .
the horrors of a concentration camp. There were six concrete boxes - gas-chambers - side by side. 'Nearly two thousand people could be disposed of here simultaneously,' one of the guides said. But what thoughts passed through these people's minds during those first few minutes while the crystals were falling; could anyone still believe that this humiliating process of being packed into a box and standing there naked, rubbing backs with other naked people, had anything to do with disinfection? ...Then a touch of blue on the floor caught my eye. It was very faint, but still legible. In blue chalk someone had scribbled the word "vergast" and had drawn crudely above it a skull and crossbones. I had never seen this word before but it obviously meant" gassed" - and not merely "gassed" but: with, that eloquent little prefix ver, 'gassed out'. That's this job finished, and now for the next lot. The blue chalk came into motion when there was nothing but a heap of naked corpses inside. But what cries, what curses, what prayers perhaps, had been uttered inside that gas chamber only a few minutes before?..." Gutman, Israel (ed. ), Encyclopedia of the Holocaust (1990); Werth, Alexander, Russia at War 1941-1945 (1964). 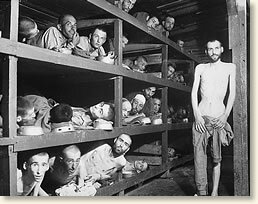 "Inside a Nazi Death Camp, 1944" EyeWitness to History, www.eyewitnesstohistory.com (2004). Hitler opened the 1st concentration camp in 1933 with the objective of transforming "antisocial" Germans into "useful members" of Nazi society. Prisoners were often identified by a different colored triangle on their uniform: red for political prisoner, yellow for Jew, pink for homosexual, black for the asocial or "work-shy", purple for Jehovah Witnesses, and green for criminals.